and push the hook through the top lip, the hook shank will be facing forward with the tip of the hook facing up. This allows the baitfish to look natural as it swims forward. Lip hooked baitfish are used tipped on a jig or live bait rigs; sliding weight bottom rig, bottom bouncers, drop shot rig or on a float/bobber set-up. By hooking the baitfish through the lips will keep the water from circulating into the gills and it will eventually die. Check your bait often. 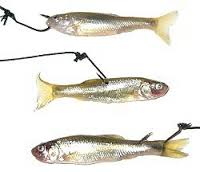 Lip hooked baitfish also work well on preserved baits. 2. The second option is hooking the baitfish through it’s back in front of the dorsal fin, be careful to pierce only the skin and not through the spine. Using this method the baitfish will keep it alive for a longer time. 3. The final option is hooking through the tail for free-line fishing. Insert the hook tip at the fleshy base of the tail and run it through, ending with the hook tip and shaft facing rearward. Use a simple split shot and hook rig cast the minnow gently and let it sink and drift while it swims freely.